Creative versus destructive chaos in Trump-land. Is there a ray of hope? At the top of Gates’s to-do list is striking the right balance between improving relations with Russia and appearing too cooperative with a belligerent President Vladimir Putin...“I think the challenge for any new administration would have been how to thread the needle — between stopping the downward spiral in U.S.-Russian relations, which had real dangers, and pushing back on Putin’s aggressiveness and general thuggery,” Gates said. Gates has shared the role of informal counselor to the Trump transition team with two other veterans of the Bush administration, former secretary of state Condoleezza Rice, who talks regularly with Vice President-elect Mike Pence, and former national security adviser Stephen Hadley. The three have a consulting firm, RiceHadleyGates, which has proposed candidates for Cabinet and sub-Cabinet jobs, including Rex Tillerson and retired Marine Gen. James N. Mattis, the choices for State and Defense, respectively. “There will be a rough break-in period,” Gates predicted. Part of the challenge is that Trump believes his success stems from his freewheeling, undisciplined style, and personal messaging through Twitter — which makes him resist limits. This year, artificial intelligence (AI) passed a significant milestone when a computer program called AlphaGo beat the world's No. 2 Go player in a five-game match. It's not the first time that AI has surpassed human mastery of a game. After all, it was 20 years ago that IBM's Deep Blue first beat Garry Kasparov in a game of chess, toppling the world champion the following year in a six-game match. But that is where the similarity ends. The rules of Go are more straightforward than those of chess: You simply place identical stones on a grid, capturing territory by surrounding your opponent's positions. But that simplicity and openness result in an explosion in the number of possible moves for a player to consider—far more than there are atoms in the known universe. That makes it impossible for AI to beat Go masters with an approach like that used by Deep Blue, which relies on handcoded strategies from chess experts to evaluate each possible move. Instead, AlphaGo, designed by the London-based Google subsidiary DeepMind, studied hundreds of thousands of online Go games played between humans, using those sequences of moves as data for a machine-learning algorithm. Then AlphaGo played against itself—or, rather, slightly different versions of itself—over and over, finetuning its strategies with a technique called deep reinforcement learning. The final result is AI that wins not just with brute-force calculation, but with something that looks strikingly like human intuition. Most of the things we want AI to master involve a seemingly unmanageable number of possible decisions—walking a robot safely through a crowded room, routing driverless cars, making small talk with passengers. Because hard-coded rules fail for such tasks, AlphaGo's triumph shows just how powerful deep reinforcement learning can be. Imagine a matrix with two axes, manual versus cognitive and routine versus nonroutine. Jobs can then be arranged into four boxes: manual routine, manual nonroutine, and so on…Jobs on an assembly line fall into the manual-routine box, jobs in home health care into the manual-nonroutine box. Keeping track of inventory is in the cognitive-routine box; dreaming up an ad campaign is cognitive nonroutine. The highest-paid jobs are clustered in the last box; managing a hedge fund, litigating a bankruptcy, and producing a TV show are all cognitive and nonroutine. Manual, nonroutine jobs, meanwhile, tend to be among the lowest paid—emptying bedpans, bussing tables, cleaning hotel rooms (and folding towels). Routine jobs on the factory floor or in payroll or accounting departments tend to fall in between. And it’s these middle-class jobs that robots have the easiest time laying their grippers on. 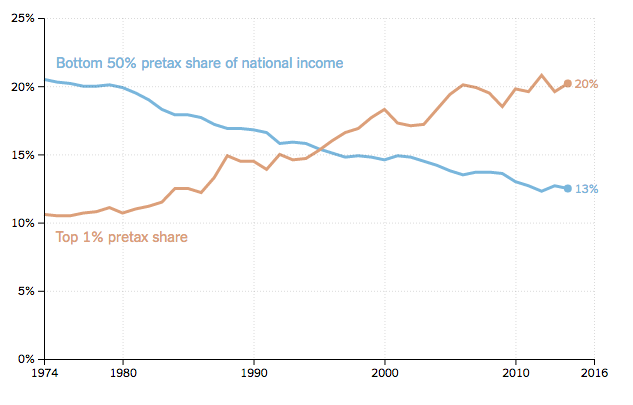 How much technology has contributed to the widening income gap in the U.S. is a matter of debate; some economists treat it as just one factor, others treat it as the determining factor. In either case, the trend line is ominous. Facebook is worth two hundred and seventy billion dollars and employs just thirteen thousand people. In 2014, Facebook acquired Whatsapp for twenty-two billion dollars. At that point, the messaging firm had a grand total of fifty-five employees. When a twenty-two-billion-dollar company can fit its entire workforce into a Greyhound bus, the concept of surplus labor would seem to have run its course. Martin Ford (author of “Rise of the Robots: Technology and the Threat of a Jobless Future”) worries that we are headed toward an era of “techno-feudalism,” He imagines a plutocracy shut away “in gated communities or in elite cities, perhaps guarded by autonomous military robots and drones.” Under the old feudalism, the peasants were exploited; under the new arrangement, they’ll merely be superfluous. The best we can hope for, he suggests, is a collective form of semi-retirement. He recommends a guaranteed basic income for all, to be paid for with new taxes, levelled, at least in part, on the new gazillionaires. To one degree or another, just about everyone writing on the topic shares this view. Jerry Kaplan proposes that the federal government create a 401(k)-like account for every ten-year-old in the U.S. Those who ultimately do find jobs could contribute some of their earnings to the accounts; those who don’t could perform volunteer work in return for government contributions. ...if it’s unrealistic to suppose that smart machines can be stopped, it’s probably just as unrealistic to imagine that smart policies will follow. Which brings us ... to Trump. The other day, during his “victory lap” through the Midwest, the President-elect vowed to “usher in a new Industrial Revolution,” apparently unaware that such a revolution is already under way, and that this is precisely the problem. The pain of dislocation he spoke to during the campaign is genuine; the solutions he offers are not. Now I know more about what is in the haze of particles I see illuminated by the horizontal rays of the rising sun flowing through my Fort Lauderdale condo in early morning. I pass on, under the "random curious stuff" MindBlog category, an accounting by Madden et al. that shows the ubiquity of insects detected in settled dust samples collected from inside homes. They used a DNA-based method for investigating the arthropod diversity in homes via high-throughput marker gene sequencing of home dust. Settled dust samples were collected by citizen scientists from both inside and outside more than 700 homes across the United States, yielding the first continental-scale estimates of arthropod diversity associated with our residences. Here is a graphic (click to enlarge), in which (A) shows the Genera detected, (B) shows orders detected in at least 5% of homes. 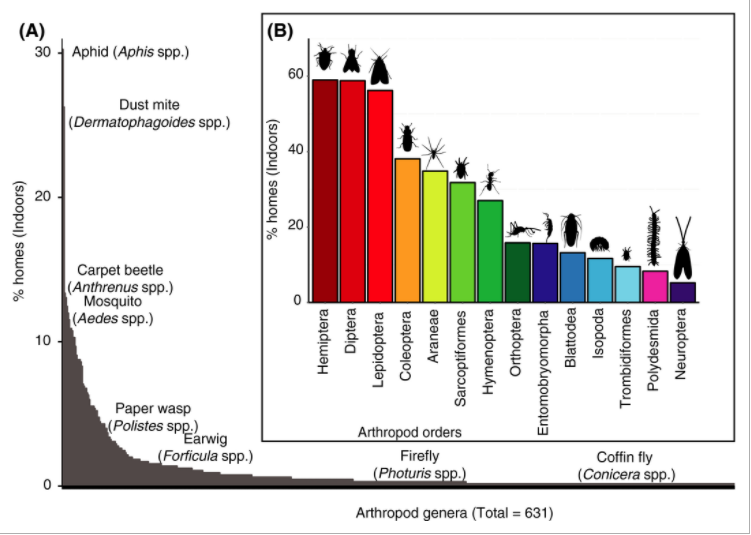 The Y-axes indicate the percentage of homes (of 651 homes with arthropods detected) where those arthropods were detected. Reducing future fears by suppressing episodic simulation in the brain. Benoit et al. offer some findings relevant to understanding the heightened anxiety many are feeling in the Age of Trump. Recurrently imagining dreaded future situations potentiates fears and can even support the development and maintenance of anxiety disorders. We tested the hypothesis that such simulations can be suppressed with the opposite effect of down-regulating apprehensiveness. Our data indicate that future suppression is based on a brain mechanism that is remarkably similar to a system implicated in the voluntary suppression of past experiences. This mechanism recruits right dorsolateral prefrontal cortex, which originates an inhibitory signal that down-regulates activation in brain regions supporting both retrieval and episode-construction processes. Paralleling the suppression of recently acquired memories, the regions targeted by future suppression included the hippocampus, a structure that is fundamental for the retrieval of past episodes and the construction of coherent future and fictitious events. Critically, the suppression of recurring fears of the future differs from suppressing past events in that it also involved modulating the vmPFC (ventromedial prefrontal cortex). The mPFC fosters the integration of overlapping memories into a common representation. To examine future suppression, we adapted the “Think/No-Think” procedure, used to study the suppression of past events, to create the new “Imagine/No-Imagine” paradigm. The procedure first asked participants to describe their fears. Importantly, they only provided recurrent future fears—that is, those that they had already worried might happen before entering the experiment. Participants then gave one key detail for each fear that was typical to their recurring imaginings of it. (These typical event details served as a dependent measure; see below.) Afterward, they entered the critical Imagine/No-Imagine phase, which was composed of trials that presented reminders to these fears. For some trials, participants were asked to imagine the feared event as vividly as possible in response to the reminder (Imagine condition); for others, participants were asked to suppress their imagining of the event, upon seeing the reminder (Suppress condition). (A third of the originally provided episodes, the Baseline items, were set aside and were not cued during this phase.) Over the course of the Imagine/No-Imagine phase, participants either imagined or suppressed a feared event 12 times. Following this phase, we gave participants each reminder again and asked them to recall the typical feature of its corresponding fear. Once all typical details were tested, participants were then asked to freely imagine each episode aloud in detail for 2 min. Finally, we assessed the impact of suppression on participants’ apprehensiveness toward these future events. Humans possess the remarkable ability to recombine details of divergent memories into imaginings of future events. Such imaginings are useful, for example, because they foster planning and motivate farsighted decisions. Importantly, recurrently imagining feared situations can also undermine our well-being and may even contribute to the development of anxiety. Here, we demonstrate that fearful imaginings about the future can be inhibited by neural mechanisms that help to suppress the past. Importantly, suppression reduces later apprehensiveness about the feared events, a benefit that was diminished in individuals with greater trait anxiety. This pattern suggests that the observed inhibition mechanism serves to control people’s future fears and its disruption may foster psychological disorders characterized by intrusive prospective thoughts. Imagining future events conveys adaptive benefits, yet recurrent simulations of feared situations may help to maintain anxiety. In two studies, we tested the hypothesis that people can attenuate future fears by suppressing anticipatory simulations of dreaded events. Participants repeatedly imagined upsetting episodes that they feared might happen to them and suppressed imaginings of other such events. Suppressing imagination engaged the right dorsolateral prefrontal cortex, which modulated activation in the hippocampus and in the ventromedial prefrontal cortex (vmPFC). Consistent with the role of the vmPFC in providing access to details that are typical for an event, stronger inhibition of this region was associated with greater forgetting of such details. Suppression further hindered participants’ ability to later freely envision suppressed episodes. Critically, it also reduced feelings of apprehensiveness about the feared scenario, and individuals who were particularly successful at down-regulating fears were also less trait-anxious. Attenuating apprehensiveness by suppressing simulations of feared events may thus be an effective coping strategy, suggesting that a deficiency in this mechanism could contribute to the development of anxiety. Soares et al. find by observing timing behavior in mice that dopaminergic neurons control temporal judgments on a time scale of seconds. Our sense of time is far from constant. For instance, time flies when we are having fun, and it slows to a trickle when we are bored. Midbrain dopamine neurons have been implicated in variable time estimation. However, a direct link between signals carried by dopamine neurons and temporal judgments is lacking. We measured and manipulated the activity of dopamine neurons as mice judged the duration of time intervals. We found that pharmacogenetic suppression of dopamine neurons decreased behavioral sensitivity to time and that dopamine neurons encoded information about trial-to-trial variability in time estimates. Last, we found that transient activation or inhibition of dopamine neurons was sufficient to slow down or speed up time estimation, respectively. Dopamine neuron activity thus reflects and can directly control the judgment of time. Western democracies are in the midst of an upheaval they only dimly grasp. Virtual direct democracy through social media has outflanked representative democracy. The impact of the smartphone on the human psyche is as yet scarcely understood; its addictiveness is treacherous and can be the enemy of thought. Mr. Trump hijacked the Republican Party like a man borrowing a dinner jacket for an evening. His campaign moved through Twitter to the aroused masses; it had no use or need for conventional channels. The major political parties in Britain and the United States will have to prove their relevance again. Democracies, it is clear, have not been delivering to the less privileged, who were disenfranchised or discarded in the swirl of technology’s advance. A lot of thought is now needed to find ways to restore faith in liberal, free-market societies; to show that they can be fairer and more equitable and offer more opportunities across the social spectrum. Germany, with its successful balance of capitalism and solidarity, its respect for the labor force and its commitments to both higher education and technical training, offers one model. The rage of 2016 will not abate by itself. The liberal elites’ arrogance and ignorance has been astounding. It is time to listen to the people who voted for change, be humble and think again. That, of course, does not mean succumbing to the hatemongers and racists among them: They must be fought every inch of the way. Nor does it mean succumbing to a post-truth society: Facts are the linchpins of progress. But so brutal a comeuppance cannot be met by more of the same. I fear for my children’s world, more than I ever imagined possible. I want to point to a brief essay by Pillemer in Aeon. His interviews with several thousand people in their 80s and 90s revealed that their common response to younger people seeking a goal or purpose in life was to tell them to relax...a life can have a number of purposes, which can shift and change as life situations, interests, and priorities change. But how should you go about finding a direction? How to settle on a purpose that fits your current life stage? One technique turns out to be immensely valuable – and yet most people ignore it. If you are searching for a direction or purpose, interview your future self...when people are made to think in detail about their future selves, they are more likely to make better financial planning decisions, show altruistic behaviour, and make more ethical choices. But it’s hard to do. He gives advice similar to that given by Daniel Gilbert in his book "Stumbling towards happiness," a book which I abstracted in a series of MindBlog posts June 29, 2006. ..it’s astonishing how few people do the next best thing: interview an older person who embodies the ‘self’ they would like to be...In any period where you feel directionless, wavering, stuck with one foot in two different worlds, and hearing in the back of your mind the song lyrics ‘Should I stay or should I go?’ – find your future self. He or she should be old – and preferably really old. You don’t want a 40-year-old if you are 20; you want someone in his or her 80s, 90s, or a centenarian if you can find one. You need your future self to have the truly long view, as well as the detachment that comes from a very long life. Binge drinking damages the brain, and although a significant amount of recovery occurs with abstinence, there is a need for effective strategies to maximize neurorestoration. In contrast to binge drinking, exercise promotes brain health, so the present study assessed whether it could counteract ethanol-induced damage by augmenting natural self-repair processes following one or more binge exposures. Adult female rats were exposed to 0 (control), 1 or 2 binges, using an established 4-day model of binge-induced neurodegeneration. Half of the animals in each group remained sedentary, or had running wheel access beginning 7 days after the final binge, and were sacrificed 28 days later. To assess binge-induced hippocampal damage and exercise restoration, we quantified volume of the dentate gyrus and number of granule neurons. We found that a single binge exposure significantly decreased the volume of the dentate gyrus and number of granule neurons. A second binge did not exacerbate the damage. Exercise completely restored baseline volume and granule neuron numbers. To investigate a potential mechanism of this restoration, we administered IdU (a thymidine analog) in order to label cells generated after the first binge. Previous studies have shown that neurogenesis in the dentate gyrus is decreased by binge alcohol exposure, and that the hippocampus responds to this insult by increasing cell genesis during abstinence. We found increased IdU labeling in binge-exposed animals, and a further increase in binged animals that exercised. Our results indicate that exercise reverses long-lasting hippocampal damage by augmenting natural self-repair processes. Dishonesty is an integral part of our social world, influencing domains ranging from finance and politics to personal relationships. Anecdotally, digressions from a moral code are often described as a series of small breaches that grow over time. Here we provide empirical evidence for a gradual escalation of self-serving dishonesty and reveal a neural mechanism supporting it. Behaviorally, we show that the extent to which participants engage in self-serving dishonesty increases with repetition. Using functional MRI, we show that signal reduction in the amygdala is sensitive to the history of dishonest behavior, consistent with adaptation. Critically, the extent of reduced amygdala sensitivity to dishonesty on a present decision relative to the previous one predicts the magnitude of escalation of self-serving dishonesty on the next decision. The findings uncover a biological mechanism that supports a 'slippery slope': what begins as small acts of dishonesty can escalate into larger transgressions. Binary decisions of agents coupled in networks can often be classified into two types: “coordination,” where an agent takes an action if enough neighbors are using that action, as in the spread of social norms, innovations, and viral epidemics, and “anticoordination,” where too many neighbors taking a particular action causes an agent to take the opposite action, as in traffic congestion, crowd dispersion, and division of labor. Both of these cases can be modeled using linear-threshold–based dynamics, and a fundamental question is whether the individuals in such networks are likely to reach decisions with which they are satisfied. We show that, in the coordination case, and perhaps more surprisingly, also in the anticoordination case, the agents will indeed always tend to reach satisfactory decisions, that is, the network will almost surely reach an equilibrium state. This holds for every network topology and every distribution of thresholds, for both asynchronous and partially synchronous decision-making updates. These results reveal that irregular network topology, population heterogeneity, and partial synchrony are not sufficient to cause cycles or nonconvergence in linear-threshold dynamics; rather, other factors such as imitation or the coexistence of coordinating and anticoordinating agents must play a role. Online social interaction associated with reduced mortality risk. Social interactions increasingly take place online. Friendships and other offline social ties have been repeatedly associated with human longevity, but online interactions might have different properties. Here, we reference 12 million social media profiles [of Facebook users] against California Department of Public Health vital records and use longitudinal statistical models to assess whether social media use is associated with longer life. The results show that receiving requests to connect as friends online is associated with reduced mortality but initiating friendships is not. Additionally, online behaviors that indicate face-to-face social activity (like posting photos) are associated with reduced mortality, but online-only behaviors (like sending messages) have a nonlinear relationship, where moderate use is associated with the lowest mortality. These results suggest that online social integration is linked to lower risk for a wide variety of critical health problems. Although this is an associational study, it may be an important step in understanding how, on a global scale, online social networks might be adapted to improve modern populations’ social and physical health. Stock trading - gut feelings help with risky decisions. Interoception is the sensing of physiological signals originating inside the body, such as hunger, pain and heart rate. People with greater sensitivity to interoceptive signals, as measured by, for example, tests of heart beat detection, perform better in laboratory studies of risky decision-making. However, there has been little field work to determine if interoceptive sensitivity contributes to success in real-world, high-stakes risk taking. Here, we report on a study in which we quantified heartbeat detection skills in a group of financial traders working on a London trading floor. We found that traders are better able to perceive their own heartbeats than matched controls from the non-trading population. Moreover, the interoceptive ability of traders predicted their relative profitability, and strikingly, how long they survived in the financial markets. Our results suggest that signals from the body - the gut feelings of financial lore - contribute to success in the markets. Like many of you, I am more than completely overwhelmed by recent political events and the avalanche of thoughtful commentary on them. I am one of a group of retired guys here in Fort Lauderdale whose members have been spamming each other with interesting articles we find. I am particularly struck by a piece from NYTimes columnist Farhad Manjoo on how the world I assumed I was living in has been shattered. Below are some edited and rearranged clips. ...widespread misinformation spread online was a primary factor in the race’s outcome...On Monday, both Google and Facebook altered their advertising policies to explicitly prohibit sites that traffic in fake news from making money off lies. That’s very likely a worthwhile fix, even if it comes too late. The internet has loosened our collective grasp on the truth...the dangers posed by fake news are just a symptom of a deeper truth... social media (such as Facebook, WhatsApp, WeChat, Instagram, Twitter, Weibo, etc.) has become an increasingly powerful cultural and political force, to the point that its effects are now beginning to alter the course of global events. The election of Donald J. Trump is perhaps the starkest illustration yet that across the planet, social networks are helping to fundamentally rewire human society. They have subsumed and gutted mainstream media. They have undone traditional political advantages like fund-raising and access to advertising. And they are destabilizing and replacing old-line institutions and established ways of doing things, including political parties, transnational organizations and longstanding, unspoken social prohibitions against blatant expressions of racism and xenophobia...by putting out a message that resonated with people online, Mr. Trump hacked through every established political order...Most important, because these services allow people to communicate with one another more freely, they are helping to create surprisingly influential social organizations among once-marginalized groups. ...shifting of the "Overton Window,” a term coined by the researcher Joseph P. Overton to describe the range of subjects that the mainstream media deems publicly acceptable to discuss...From about the early 1980s until the very recent past, it was usually considered unwise for politicians to court views deemed by most of society to be out of the mainstream, things like overt calls to racial bias (there were exceptions, of course, like the Willie Horton ad). But the internet shifted that window...now each person with once-maligned views can see that he’s not alone. And when these people find one another, they can do things — create memes, publications and entire online worlds that bolster their worldview, and then break into the mainstream. The groups also become ready targets for political figures like Mr. Trump, who recognize their energy and enthusiasm and tap into it for real-world victories...the Overton Window isn’t just shifting on the right. We see it happening on the left, too. Mr. Sanders campaigned on an anti-Wall Street platform that would have been unthinkable for a Democrat just a decade ago. Our working memory modulates our conscious access to suppressed threatening information. We used a modified version of the delayed-match-to-sample paradigm. Specifically, participants were instructed to keep a face (either fearful or neutral) in WM while performing a target-detection task. The target, another face with a new identity (fearful or neutral), was suppressed from awareness utilizing continuous flash suppression. In this technique, the target is monocularly presented and hidden from visual awareness by simultaneously presenting dynamic noise to the other eye. We measured the time it took for the suppressed face to emerge from suppression. We specifically tested whether faces would emerge from suppression more quickly if they matched the emotional valence of WM contents than if they did not. Previous research has demonstrated that emotional information processing can be modulated by what is being held in working memory (WM). Here, we showed that such content-based WM effects can occur even when the emotional information is suppressed from conscious awareness. Using the delayed-match-to-sample paradigm in conjunction with continuous flash suppression, we found that suppressed threatening (fearful and angry) faces emerged from suppression faster when they matched the emotional valence of WM contents than when they did not. This effect cannot be explained by perceptual priming, as it disappeared when the faces were only passively viewed and not held in WM. Crucially, such an effect is highly specific to threatening faces but not to happy or neutral faces. Our findings together suggest that WM can modulate nonconscious emotion processing, which highlights the functional association between nonconsciously triggered emotional processes and conscious emotion representation. We theorize that people’s social class affects their appraisals of others’ motivational relevance—the degree to which others are seen as potentially rewarding, threatening, or otherwise worth attending to. Supporting this account, three studies indicate that social classes differ in the amount of attention their members direct toward other human beings. In the first study, wearable technology was used to film the visual fields of pedestrians on city streets; higher-class participants looked less at other people than did lower-class participants. A second study tracked participants’ eye movements while they viewed street scenes; higher class was associated with reduced attention to people in the images. Finally a third study used a change-detection procedure to assess the degree to which human faces spontaneously attract visual attention; faces proved less effective at drawing the attention of high-class than low-class participants, which implies that class affects spontaneous relevance appraisals. The measurement and conceptualization of social class are discussed. Li et al. find that a set of oxytocin-responsive neurons in the medial prefrontal cortex (mPFC) look similar in both sexes, but in males they secrete a protein (CRHBP) that antagonizes the effect of the corticotropin-releasing hormone (CRH) associated with stress, thus causing an anti-anxiety effect with males that is not seen in females. This suggests the possibility of developing gender specific therapies for anxiety. The frequency of human social and emotional disorders varies significantly between males and females. We have recently reported that oxytocin receptor interneurons (OxtrINs) modulate female sociosexual behavior. Here, we show that, in male mice, OxtrINs regulate anxiety-related behaviors. We demonstrate that corticotropin-releasing-hormone-binding protein (CRHBP), an antagonist of the stress hormone CRH, is specifically expressed in OxtrINs. Production of CRHBP blocks the CRH-induced potentiation of postsynaptic layer 2/3 pyramidal cell activity of male, but not female, mice, thus producing an anxiolytic effect. Our data identify OxtrINs as critical for modulation of social and emotional behaviors in both females and males and reveal a molecular mechanism that acts on local medial prefrontal cortex (mPFC) circuits to coordinate responses to OXT and CRH. They suggest that additional studies of the impact of the OXT/OXTR and CRHBP/CRH pathways in males and females will be important in development of gender-specific therapies.